If you follow the world of obsessive coffee experts like we do, you have no doubt heard of NYC’s Sweetleaf. 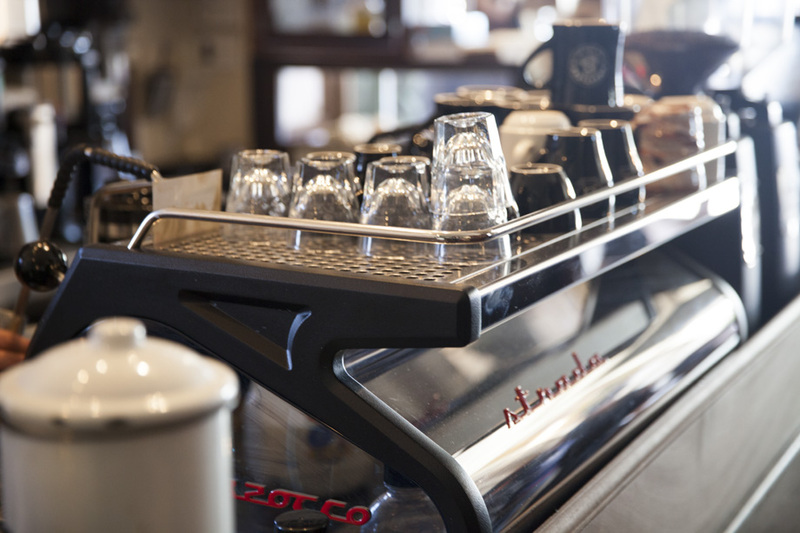 Our mornings at Manhattan Fruitier almost always begin with a daily pilgrimage to Sweetleaf where master barrista Rich Nieto and his expert staff precision-brew the best espresso and coffee in the city. But if you look past the morning crowds and the antique furniture and through the glass window you will see what really makes Sweetleaf buzz — Rich’s secret weapon, baker Beverly Lauchner and her dazzling baked goods. Beverly whips up the most sublime scones, biscuits and cookies this big city has to offer. Once we became addicted we knew we had to share them with our customers too. Beverly Lauchner, Sweetleaf bakery wiz and creator of Manhattan Fruitier’s sublime small-batch scones and biscuits. 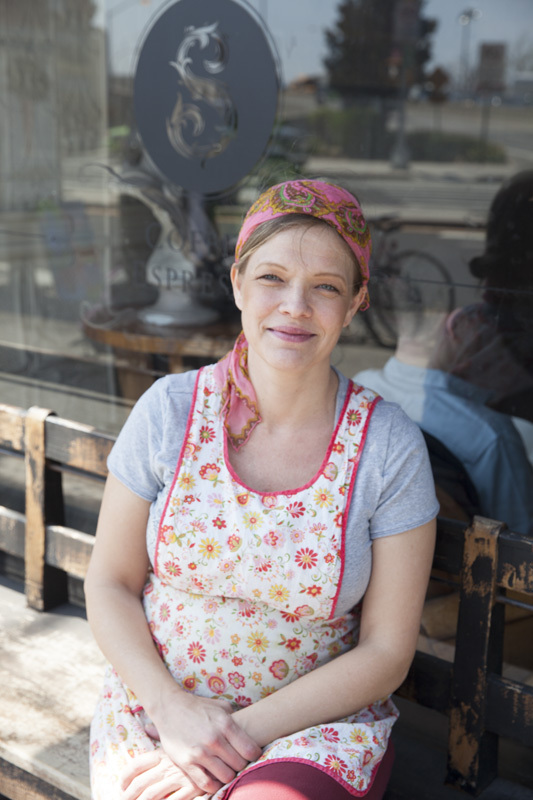 Mother’s Day is this week and with Bev six months pregnant and busily baking our Mother’s Day gifts in the Sweetleaf kitchen, we thought it would be fitting to feature Beverly Lauchner of Sweetleaf as our May Maker of the Month. Beverly took a ‘coffee break’ to chat with us about the genesis of the Sweetleaf bakery, her thoughts on new directions in baking and what makes a perfect biscuit, among other things. When did you start baking professionally? Back in 2003 I got my first job as a cake decorator on the Upper East Side but I had no professional skills as a cake decorator. They basically trained me on the job. What is the first thing you baked where you said, ‘I’m good at this. I can do this for a living.’? I fell in love with baking as a little girl because I had a sweet tooth. I was always making brownies and cakes, of course from boxed mixes at that point. After college I moved to New York on my own and I started baking again. Cookies were the thing. I love making up new recipes and flavors. That time is when I discovered, ‘oh, I’m really good at this.’I started branching out into cakes, cupcakes and pies and found out I could make them all really well. Who or what are your inspirations when creating your recipes? Most of the recipes that I develop are typically vegan and/or gluten free. I don’t usually create ‘normal’ baking recipes. Part of that is because of where I am transitioning my life now into a healthier field (Beverly is finalizing her master’s degree in nutrition at CUNY School of Public Health at Hunter College). I’ve never found a lot of tasty vegan and gluten-free items so it’s really not a person that inspires me–it’s more the inspiration to make things healthier or without allergens. Beverly Lauchner making a batch of Manhattan Fruitier’s Black Pepper Biscuits. What are your thoughts on the gluten-free explosion of goods on the market right now? I feel like it’s kind of a trendy thing for sure. There is a misconception that vegan and gluten-free means healthier but it doesn’t mean healthier at all. It just means made without animal products or made with flours that don’t contain gluten. They are still usually loaded with sugar and can have a bunch of junk in them and still be super unhealthy and people can gain a lot of weight eating them. That being said, I still feel there is a place in the world for all baked goods. There is a need for gluten-free items because there are people with celiac disease or gluten intolerances. It can be very damaging for them to eat the gluten so it’s good that there are a lot more options now than even five years ago. But I also feel like a lot of people have the misconception that it’s going to make them healthier or they will lose a lot of weight. They are misinformed. 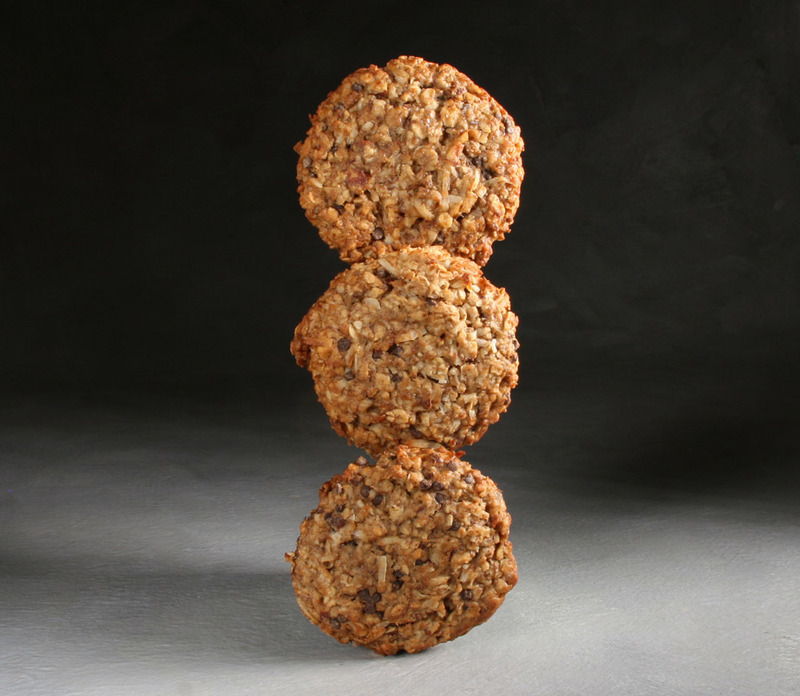 Vegan Choc-a-block Cookie Trio by Sweetleaf for Manhattan Fruitier. Do you prefer any style of baking to another? Vegan or traditional butter and eggs? It depends on what I’m making. If I’m making things for other people I will bake with traditional butter and eggs. People just want the sugar! If I’m making something for myself I might try to make it a little healthier, and play with the recipe, taking a traditional recipe and adapting it to a healthier version. What do you bake for yourself when you bake at home? At home I bake breads which is not something we do here at Sweetleaf. I’ll do a salami rosemary bread to go with a soup I’m making, for example. Sometimes I’ll do bran muffins. Cookies, but they are not usually for me to eat. They are something for me to give to people. I actually don’t bake as much at home as I used to. Maybe it’s because it’s what I do every day so when I get home I don’t usually want to bake. Barristas Doug and Irene precision brew espresso and coffee at Sweetleaf on Jackson Avenue. 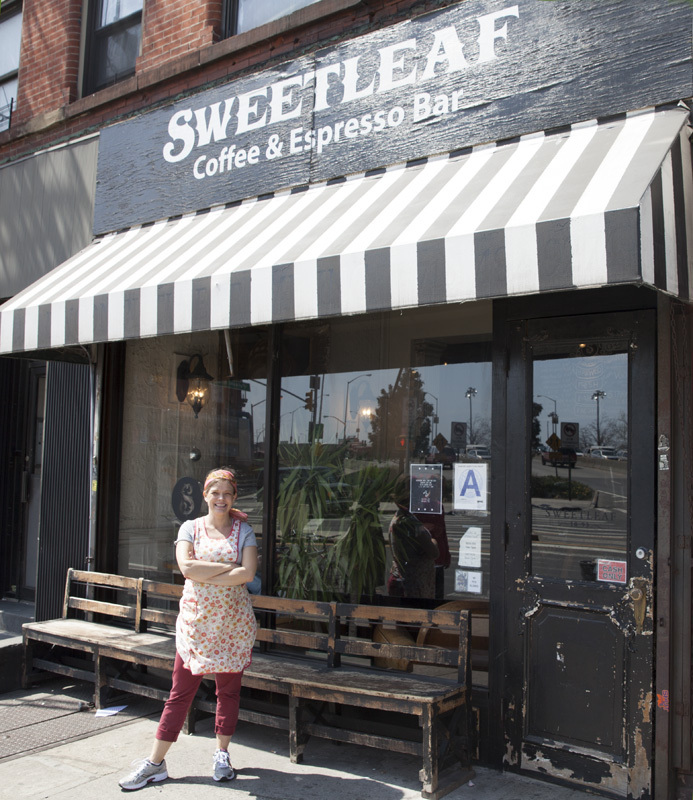 Sweetleaf has three locations–one in Williamsburg and two in Long Island City. 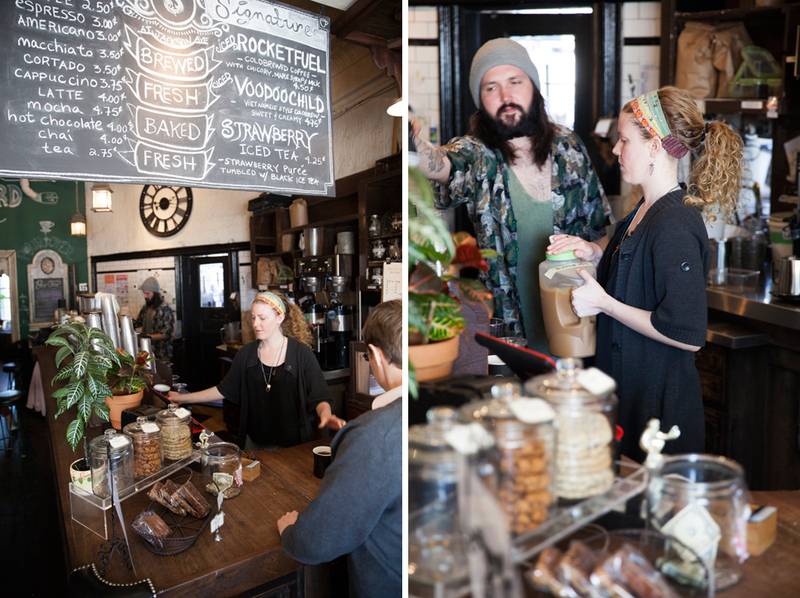 Sweetleaf started as strictly a coffee and espresso bar. When did you start baking in-house? When Sweetleaf first opened they were basically buying frozen muffin batter and frozen cookie dough and baking that off. That was pretty much all they offered. The neighborhood was starting to change, sales were picking up and they were ready to up their game. They were looking for a creative baker and at that time I was transitioning out of my catering company and looking for something new. They hired me on in 2010 and said do what you want. It gave me the freedom to basically build my own bakery from scratch without having to pay for it. Which I loved! I just went crazy and tried everything under the sun. I introduced scones which are now one of the biggest sellers. At that time vegan and gluten-free was absolutely, no way! I put things out and people were like, ‘NO!’. So then I changed it to say no dairy or no eggs and people were like ‘Ok.’ Now people want to see the words. It’s really just in the last two years that we’ve seen the change. 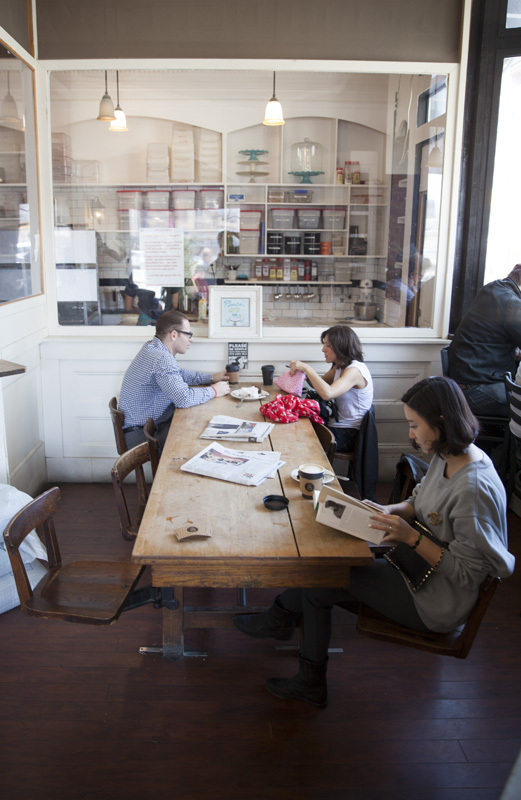 Who are your customers at Sweetleaf in Long Island City? How has the neighborhood changed since opening in 2008? It seems like there are way more people, for sure. The socioeconomics of the neighborhood has changed. People who make more money live here now. A lot more baby strollers. A lot more people who are looking for higher quality products than I think they were looking for before. Especially with coffee. They are coffee snobs. They want a really good cup. Communal table and the bakery beyond the window at Sweetleaf in LIC. This week you are taking your final exams for your master’s degree in nutrition while you are six months pregnant with your first child, plus overseeing day to day operations here at Sweetleaf, not to mention baking Manhattan Fruitier’s Mother’s Day orders. What is your secret weapon for stress management? How do you balance all that? Ice cream. I can’t drink wine, so I’m eating ice cream instead! I go to yoga – that helps a lot. I’ve been trying to learn to meditate on my own at night and walking. I can’t run anymore, being pregnant, so I’ve been going for walks near where I live in a beautiful wooded area, Pocantico Hills, the Rockefeller Estate preserve. That’s very calming and relaxing and it’s been helping me get through the next few weeks of life. How does the study of nutrition influence the way you bake? It definitely makes me more conscientious about what I may be contributing to the declining health of society which is part of the reason why I started to change my focus. I started having moral issues with that as people in my family were getting sick. I was always preaching to them ‘eat healthier, eat healthier.’ And then I make cupcakes, you know? That was really the catalyst for my transition. Beverly Lauchner making biscuits in the Sweetleaf kitchen. But I love baking so much. I want to find a way I can bring more healthiness into baking because I feel everyone should be able to eat baked goods. I don’t think we should tell people to get rid of this completely because then they binge and that’s just not a good way to live. There are a lot of healthier options you can use to replace saturated fats. For instance, replacing eggs with apple sauce or butter with fruit purees. The food science classes I took were really interesting to learn what each part of the baked good provides to its structure and how you can change those out to decrease calories or decrease fat. Move more and eat less. Truthfully the majority of your diet should be fruits and vegetables. It’s what most people are missing. Especially the vegetables. It’s important to treat yourself once in a while–just not every day. You spend a good part of your day studying nutrition and baking addicting sweets. I’m curious about how you will introduce sweets to your new child and if you have any advice for parents who are struggling with finding a balance for their kids. The thing that you really have to ingrain in them are habits. Not a focus on nutrition, because kids- they can’t wrap their head around that. They are too young. Instead, focus on building healthy habits. Research has shown that the habits you build in childhood stay with you for the rest of your life. I mean, you can change them. I grew up eating Little Debbies and not healthy stuff. But it was a conscious effort and it took me a long time to learn to eat healthier. It’s really hard, especially when you are 40 or 50 years old. That’s why some people have problems with diabetes. They can’t make that behavioral change. So start those habits early. Fruits are really the first sugars that children eat. Parents don’t start kids on cakes and candies. Introduce fruits as part of a meal but also as a dessert too. Applesauce and purees of fruits don’t have to have sugars added. They are sweet on their own. So that’s where you start. Cakes and candies come later for special occasions. Sweets should be a treat. They are not everyday foods. They aren’t even sometime foods. They’re once in a while foods. What do you think is the next big trend in the world of sweets and what needs a rest? I think cupcakes need a rest. I’m over cupcakes. And cake pops. They tried to make those trendy but they are so labor intensive to make. Next big thing? There are just so many very creative people baking now. I think vegan and gluten free is going to continue to be popular but I also think those really cool specialty items like Dominique Ansel is making, cronuts and chocolate chip cookie cups with milk shooters in them, those kinds of things. Specific places that make really cool specialty products I think people will try to copy. Biscuits are very southern. They should come up north a little bit more. What is the secret to making the perfect biscuit? Part of it is cutting in the butter properly. You can’t use a mixer because the butter has to be cut in so the texture is like little sandy pebbles. You can use a pastry blender or you can use a food processor but it has to be pulsed. You must use really cold butter and then the proper folding of the dough and cutting is so important. If you twist the cutter when you cut it, it’s more likely to lean over because you’ve messed with the sides of the structure of the biscuit. Then just quality ingredients. Truthfully, the best biscuits are made with this flour that you can’t get anywhere outside of the south. Daisy flour. Really good butter and buttermilk is so important and just folding the dough properly. You have to handle it really well. 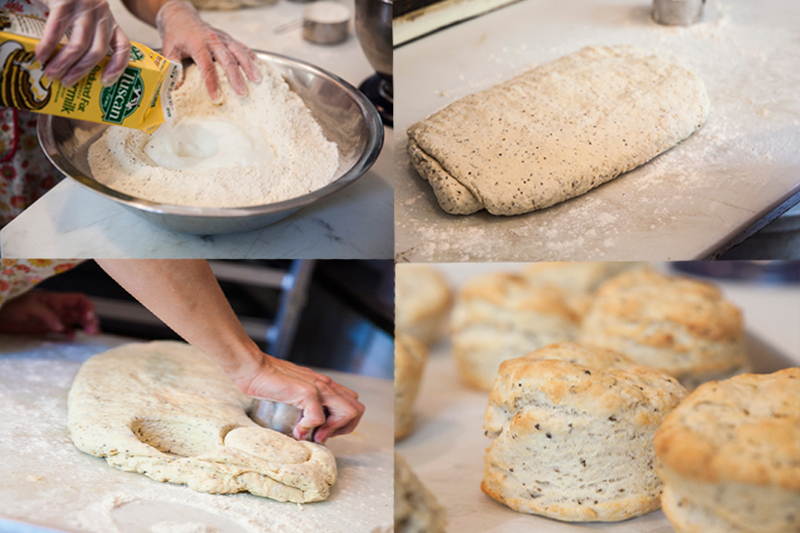 Mixing, folding, cutting and baking the perfect biscuit at Sweetleaf. What’s the craziest thing you’ve ever baked? I’ve come up with some funny stuff. I think my most creative thing that I’ve actually kept making is the gluten-free chockablock cookie. Similar to the one I make for Manhattan Fruitier, but with the addition of curry. I like to throw odd ingredients into my baked goods. I’m big on herbs so I like to use rosemary and thyme and sage, and things that people don’t really think of when they think of a cookie. People will all of a sudden bite into rosemary and say ‘what was that?’. I love those surprises. I make chocolate covered bacon chocolate chip cookies once in a while that are really good but they are so labor intensive, cooking the bacon, making the chocolate, etc. It’s just too much. 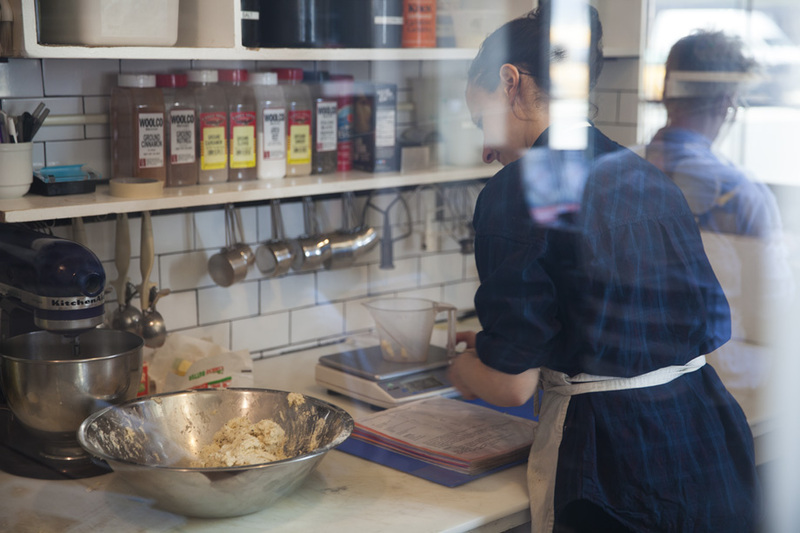 Reflections of customers and the busy kitchen of Sweetleaf. What’s a good day in the Sweetleaf kitchen? When all the equipment works. That’s a big one. Most days are good here. We’ve got a really great team that works well together. We have a mixture of big personalities, and quieter people. Some experienced bakers and some with no experience at all in the kitchen. When we’ve got the most experienced people in the kitchen everything flows. People know how to move around each other properly, there’s no traffic jams but the more inexperienced bakers, they are learning. That’s something I really love about the Sweetleaf bakery is that we are a teaching kitchen. We will hire people that don’t have a lot of experience baking, some with none at all. We’ve taught them from scratch. One of our better bakers started here and never really had a job before. What makes you take that chance? Do you see something in the person? Part of it is I don’t believe that you have to go to culinary school to be a good chef or baker. Yes, there are a lot of things you can learn in culinary school but you can learn a lot of those same things working in a kitchen. If you have the passion for it and you want to learn, then you can. I didn’t go to culinary school. I thought about it, but at the time I had already worked in a lot of kitchens and I didn’t want to pay $30,000 to relearn all that stuff. Yes, there are things I could have learned that I don’t know yet. But I could also pick up those skills on my own if I want them. I think it is important to give other people that opportunity. Not everyone has the money to go to culinary school. So that means they can’t have a job? My first job as a cake decorator the boss took me on when they knew I didn’t have any experience. But they knew I had a passion for baking and they believed I could learn the rest. I’ve always wanted to pass that on to someone else. 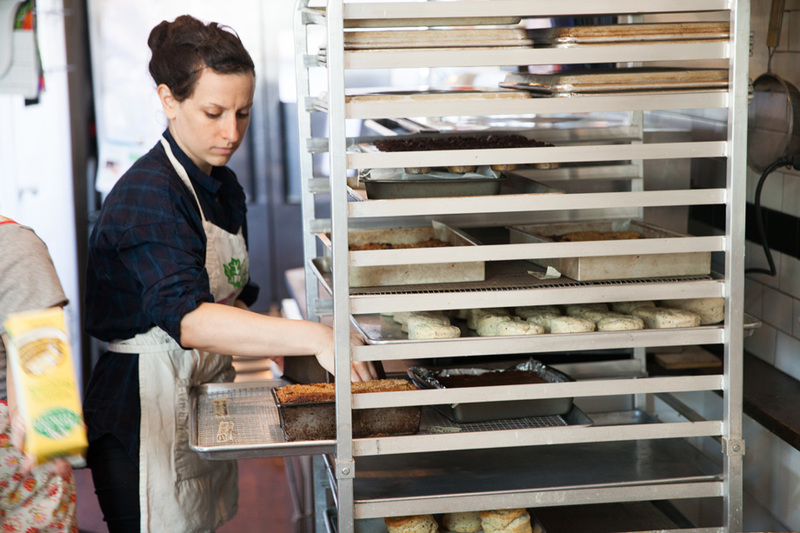 Angela, one of Sweetleaf’s expert bakers, prepping for the oven in the Sweetleaf kitchen. 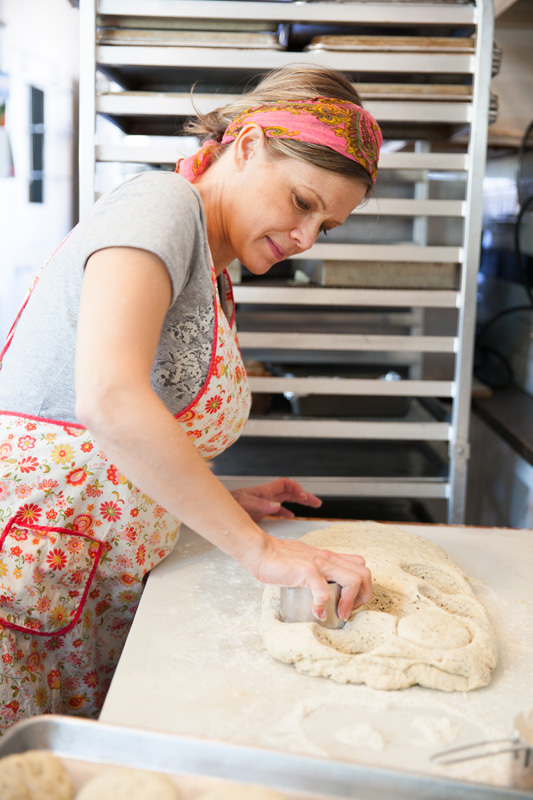 What advice do you have for someone who is just starting out and wants to become a baker? Bake at home, try things out, be creative. Learn about the science of baking. I think that’s a big thing. A lot of bakers and cooks in general don’t understand the science of baking, like what do the eggs do? Why are they being added to this recipe? Or why do we cream the butter? What’s the point of that? I think learning those little things will help you become a better baker because you can figure out why things are going wrong. You can understand, Ok. This didn’t have enough air in it, that’s why it didn’t rise. Or why did I get more cookies out of this batch than the last? Well, because you creamed the butter for longer and now you’ve got more volume in the batter. Learning those little tricks, the science behind it will make you a better baker and will help you as you go into jobs with that knowledge. You’ll be able to figure out what’s going wrong and fix it. But really just try to get your foot in the door somewhere and gain experience. And be open to constructive criticism and more experienced bakers helping you along and not taking it personally. They are just trying to help you improve with their feedback. Baker Beverly Lauchner outside of Sweetleaf in Long Island City. You are going to be a mom very soon. What will you look forward to for a perfect Mother’s Day? I would love to just go to a park and have a picnic with my daughter and my husband. Sit outside with my family and just enjoy life. I’m a huge picnic person. I love to be outside in parks with the food I’ve brought and spending time with my family. I think that is a perfect Mother’s Day. Butter My Biscuit from Manhattan Fruitier. Proper Tea and Scones from Manhattan Fruitier. Sweetleaf photos by Nelson Castillo. Manhattan Fruitier photos by Drew Pleak. This entry was posted in Maker of The Month. Bookmark the permalink. Thank you – I am out here in California but feel like I just visited Sweetleaf!